For a while, a long while, I struggled with getting my 2 year old to eat her lunch. It seemed she was always eating, but never finished her lunch. Another problem I ran into was the nuance of packing lunch in a few different containers each day. Sometimes parts of her meal wouldn't even be touched. She is very young so I wanted something she could manipulate all on her own. That is when I came across the Yumbox. Since introducing this to Kait she has done much better with finishing her lunch. I have really come to love this product, not only for my daughter but for myself as well. It has also been my go to gift for my family. They are absolutely leak proof. In order to avoid any spills it is very important not to overfill the compartments. If you have to force the lid closed, chances are there is going to be a leak. Additionally, these are not designed for true liquids like milk, yogurt drinks, etc. It works with applesauce, ranch, yogurt, etc. It is very easy to open and close. My two year old can use her Yumbox with ease. The material it is made of is very durable and also very light weight. The box itself isn't huge, especially when taking into consideration all the food that it acutally holds. The inner tray is removable. It is TOP RACK dishwasher safe. It is advised that you take the outer box out before the heat cycle. I take both out before the heat cycle. They are BPA Free, Phthalate Free and FDA compliant. It makes it easy for children to become involved in packing their own lunch. There are a few differences between the Original 6 Compartment Tray and the Panino. The major difference between the two styles is the actual configuration. The 6 Compartment tray has 5 areas that hold 1/2 cup each and very teeny area that is designed for dip or sweet treats VS the Panino that has a large area that holds 2 cups, 2 smaller areas that hold 1/2 cup and a well that can hold up to 1oz. The trays are designed a little differently as well. If you look at the bottom of the trays you will find that the Panino has a smooth bottom, while the Original does not. What does this mean? It means that the areas in the Panino are a little deeper than the Original and also water doesn't get pooled in the tray. Look at the picture below to see what I mean. What I don't really like. The box can be a bit big for some lunch bags. 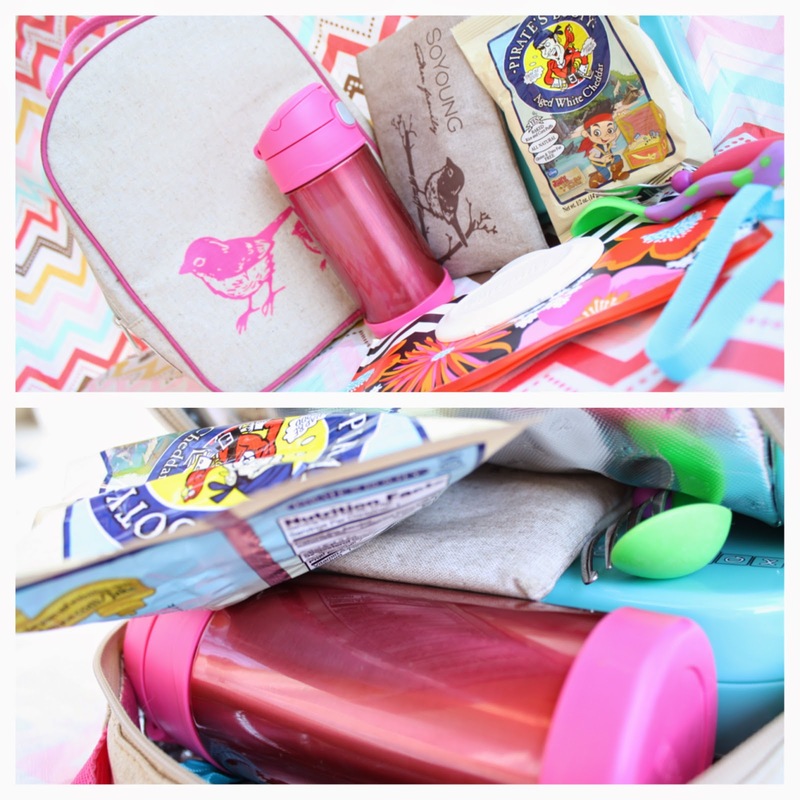 Both of the lunch bags basically fit the the same contents with the exception of the Thermo cup. In the second lunch bag, the Thermo cup was replaced by a juice box. 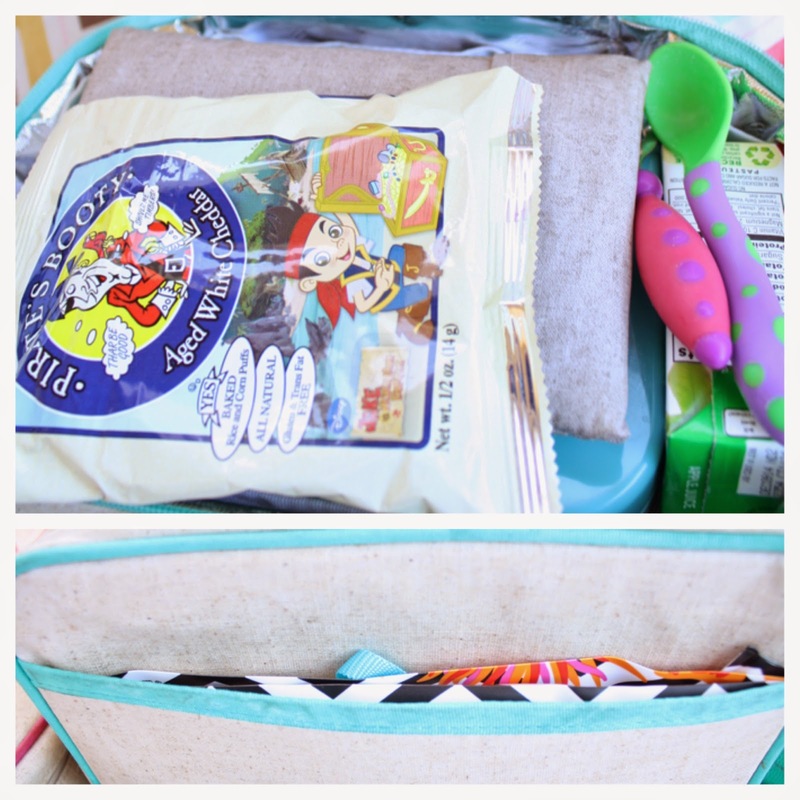 Contents include: Yumbox, Ice pack, Utensils, snack bag, beverage and wipes. I pictured how I fit it all in the bag. Another thing to keep in mind is that the Original is a perfect size for a younger child but may still leave an older child or adult feeling hungry. I, however, use the Panino almost every day and I have never left hungry! I also really don't like how water pools at the bottom of the tray in the Original Yumbox. It can make is hard to dry. One last thing, there is a little spot in the Original that seems to be just dead space. I would like to see this space used. ****One other thing I must mention. Although both boxes are configured differently, they are the exact same size (8.5 in x 6.5 in x 1.8 in). Both trays can fit into each others cases, but the seals don't line up. This means they will NOT be leak proof and you run the risk of damaging the seals. Notice how the seals are totally different. Here is a fun little experiment I conducted. I filled each compartment with different extra runny liquids. I shook it up and put them on their side for about and hour. I used a yogurt drink, milk, soy sauce, oil, hot sauce and water with food coloring. Here is the result. I ended up adding food coloring to the milk and changing the water from orange to purple, but I forgot to take a picture, whoops! Anyway, mostly everything stayed put. The spill over we see is actually what dripped when I opened the lid. The real test was putting it up on it's side. The milk leaked VERY slowly. The water ran into the yogurt drink, and the oil ran into the water. Oddly enough, the soy sauce and hot sauce stayed put. All in all, I am thoroughly impressed. Disclaimer: These are my true honest opinions, I have recieved no compensation for writing this post.